We reproduce below a few sample pages from the Intarsia book, showing the immense variety of symmetry types and themes the set invites you to explore. One of the themes is maximum and minimum number of color regions. Here are a couple of solutions found by Daniel Austin, with, respectively, 64 and 8 regions. Now 8 is not the absolute minimum. We're still looking to better our lowest score of 6. 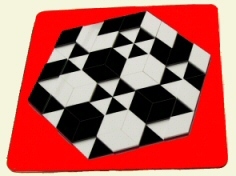 And here are two solutions by Dan Austin with the rarest of all, six-fold symmetries, both rotational and mirror. 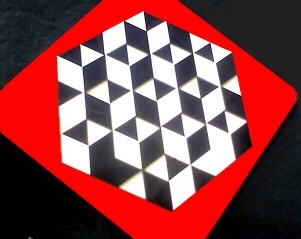 This solution full of optical illusions is by Nancy Koles. We count a total of 25 cubes, many of them overlapping. Can you spot them all? 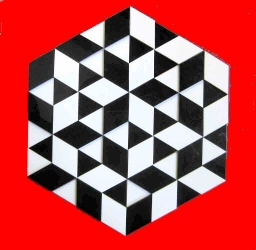 Intarsia's simplicityjust two kinds of tilesillustrates dramatically the amazing capacity of life, the Universe, and everything to build to complexity from varying combinations of the most elementary particles. 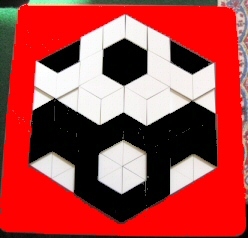 At the human level of just 32 pieces that you can manipulate with two hands and move through space on the table to reorganize at will, you can proceed at your own comfortable pace. To calculate the total number of possible placements in the tray takes heroic mathematical calculations. We thank our friend, Eric Postpischil, for contributing some astronomical combinatorial statistics. And Henrik Morast worked out the analysis that yielded a mind-boggling total of 10 to the 24th power. That's a 1 followed by 24 zeroes! 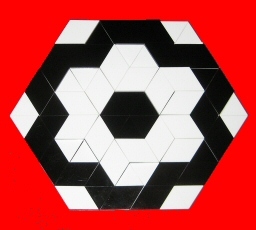 Just see how many ways one pair of tiles can join to form a single hexagon. If we call the two tiles A and B, then we can join AA, AB and BB. 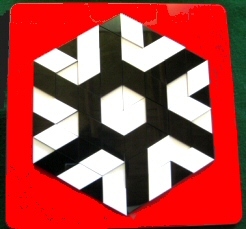 In each pair a tile can be either side up, giving us 4 different combinations for each of the three pairings, or 12. 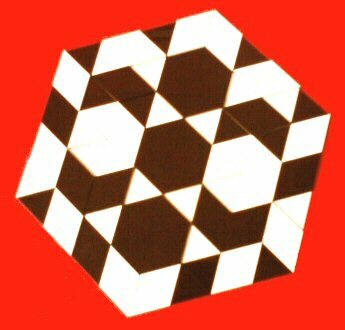 But a hexagon can have 6 orientations, so we get 12 times 6, or 72, including rotational equivalents. And we're only at the first step. 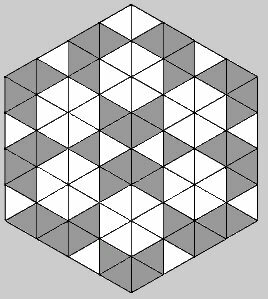 How many ways can the 32 tiles be paired? That's 32-factorial, or 32x31x30x29... It's nice to contemplate that we have so many options, so many choices with which to bring our vision into reality. Gene Roddenberry, the creator of Star Trek, had a great motto: IDIC  "Infinite diversity from infinite combinations." We rediscover the truth of that with every Intarsia arrangement. Even when the total of possibilities is beyond the range of our ability to encompass, we can glimpse it and play with it in beautiful ways. Our minds can touch the infinite and feel its echo in ourselves.